The biggest paradoxical secret for playing slots is that actually there are no slots secrets. There is no system for playing slots that may give you effective tips on how to win at slots. The random character of slots makes it a game of chance which means that one has equal odds of hitting the winning combination and the combination that pays nothing. Here you can see the list of main slots secrets and myths based on false assumptions. Some players assume that if anyone has just hit a jackpot, they may get that jackpot too if they keep playing. It is false. 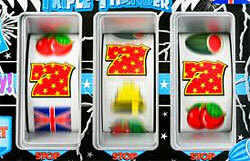 In fact, modern slots are operated by the slots Random Number Generator (RNG). The thousands of number combinations the RNG produces every second are absolutely random, as its name suggests, and the chances of hitting the same combination twice are very unlikely. It is possible to calculate the winning odds by counting symbols on the reels. As it was mentioned above, the RNG determines the outcome of every given spin of the reels. For example, there may be 20 symbols on each reel of the 3-reel slot machine. One can multiply the number of reels and symbols and get the total of 8,000 possible combinations. In reality, RNG may come up with 256 different outcomes for each spin, which makes the chances of hitting a winning combination one in 16,777,216. One of the popular slots secrets is that casinos may change the payout percentages of the slot machine in the twinkling of an eye. It is impossible to change the payout percentages for the machine without changing the computer chip installed in it. To change the chip is possible, but too expensive and time consuming for the casino. Some players make a false assumption that a machine with a lever pays offers more chances of winning than the one with the "Spin Reels" button. It is false as both types of slot machines are operated by the RNG and offer the same odds of winning. Both pulling the handle and pushing the button simply start the mathematical process of counting. As soon as the reels start spinning, winning combinations will already be determined by the RNG. Another popular myth claims that a machine that hasn't hit for a long time is likely to hit. The game of slots is an independent trial, especially as it has the RNG, and the previous game results here don't depend on the future outcomes. This offers equal slot machines odds of winning or losing. According to one of the slots secrets, if you insert hot coins (or new coins) in the slot machine, you are more likely to win. Again false. One should be really light-headed to believe in a myth like that. The gear of the slot machine cannot be influenced by temperature (perhaps unless it is set on fire). Some players think that using their slot club cards may reduce the payout percentages of the machine. It is untrue. Refusing to use the club card, you might deprive yourself from getting favorable comps and even refund from the casino. There is an assumption that payout percentages for slots are better on weekends. Even though the casino could possibly want to attract more people on weekends when the demand is higher, as it was mentioned above, it is impossible to change the percentages for slots defined by computer chips. If you read our recommendations attentively, you may see that there are no particular slots secrets defining how to play slots. In fact, what one can to be a success at slots is set a substantial bankroll, get acquainted with the payout tables - and spin the reels!